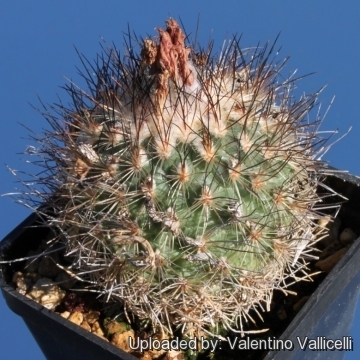 Like most Turbinicarpus species, this is a handsome cactus with beautiful spine patterns, it is recognizable without problems for the dark black spines and areoles with white wool (when young), soon becoming bare. Origin and Habitat: Mexico, in the state of Tamaulipas, Nuevo León and San Luis Potosí. Turbinicarpus viereckii has a limited range (extent of occurrence about 2,000 km²) and the population consists of less than 10,000 individuals. Altitude range: This species is found at an altitude of 750-850 metres of altitude. Habitat: Turbinicarpus viereckii grows in semi-desert (Tamaulipan Shrubland) among calcareous rocks in cracks, on cliff faces, so they get very little nutrients, and grow nearly free of organic matter. The only naturally occurring organic matter will be leaves blown around and getting caught on the spines. Illegal collecting threatens some subpopulations. Turbinicarpus viereckii subs. neglectus D.Donati & Zanov. 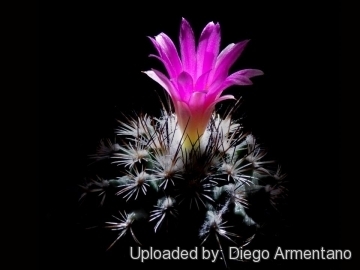 Description: Turbinicarpus viereckii, more often known with its old name Gymnocactus viereckii, is an attractive dwarf cactus covered with characteristic glassy white and black spines with bright magenta flowers. Habit: Usually solitary, occasionally clustering. Stem: Dull green, globose to slightly cylindrical 3-5 (-12cm) tall, 3-5(-7) cm in diameter apex with abundant white wool. Ribs: 15 to 18 ribs divided in tubercles. Tubercles: 6 mm long rhomboidal conical. Central spines: 3 to 5 white with black tips in a cross like formation, 2-4 cm long. Radial spines: 17 to 22 rigid white translucent, some with brown tips, 0.8-1.3 cm long. Flowers: Bright magenta or pink with greenish-white throat and darker mid-ribs, 1.5-2.5 cm long, 12-20 mm broad. 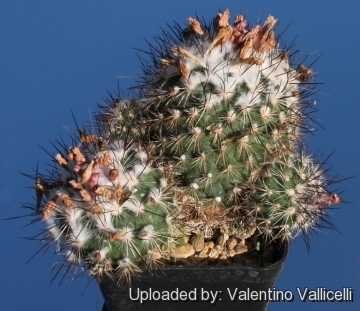 Turbinicarpus viereckii (Werderm.) V.John & Říha: Usually clustered, only 3-4.5 cm in diameter. Radial spines 17-22. 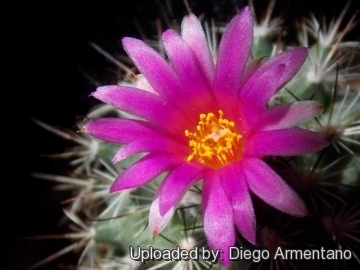 Flowers: Magenta: Distribution: valley of Jaumave, Tamaulipas. 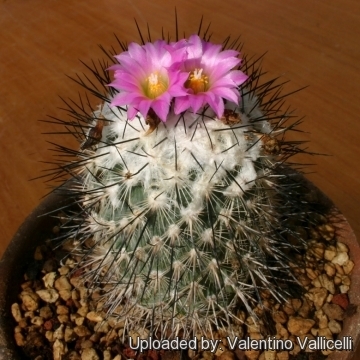 Turbinicarpus viereckii subs. major (Glass & R.A.Foster) Glass: usually solitary, 4-6.5 cm in diameter. Radial spines: 13-16. Flowers: white. Distribution: Nuevo Leon and San Luis Potosi. 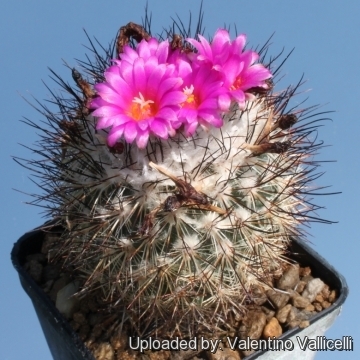 Turbinicarpus viereckii subs. neglectus D.Donati & Zanov. : Usually solitary, up to 5 cm in diameter. 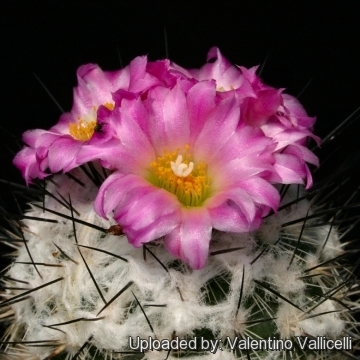 Radial spines 16-20, glassy, central spines 7-9, rigid, acicular, yellowish with black tips; Flower: magenta. Distribution: Jaumave valley, Tamaulipas. 5) Fitz Maurice, W.A. & Fitz Maurice, B 2013. 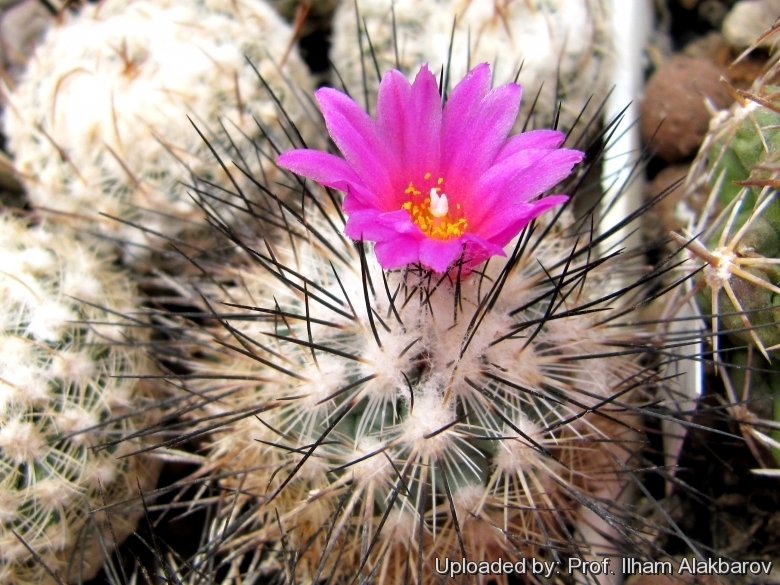 Turbinicarpus viereckii. The IUCN Red List of Threatened Species. Version 2015.2. <www.iucnredlist.org>. Downloaded on 18 July 2015. Cultivation and Propagation: This species is easy to cultivate in a very open mineral mix, (lots of pumice). 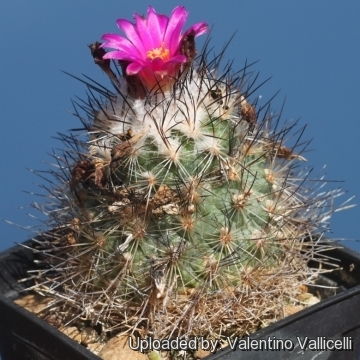 Requires full sun or Light shade and careful watering to keep plant compact and maintain strong spines. Water sparingly during the growing season as they are sensitive to over watering. Keep dry in winter. Hardy to -4°C for a short period.